Viticulture, the driving force for quality is taken to extremes without compromise. In the winery, to fully capture and highlight the terroir, the most advanced equipment available today, which has been designed for small, quality wine production, has been chosen. Hand harvested fruit is processed within 30 minutes of picking. Hand sorted, the fruit is gently de-stemmed in a French Delta de-stemmer and transported, intact, to small 2-4 ton temperature controlled stainless steel fermentors. Fermentation and maceration lasts for 3-4 weeks. Following fermentation the final blend between the four varieties is committed to and as malolactic fermentation begins, the wine goes into new French oak barrels stored in caves 10 floors below the fermenting cellars. During an average of 20 months, depending on the vintage, the wines are periodically racked, always barrel to barrel using air pressure; at the end of the first year, if necessary, they are fined with egg whites. Here in these deep, cool cellars the wines literally age in the soils from which they grew. A small quantity of Chardonnay is also produced at Forman Vineyard. A passion for a more austere Chablis style wine from this noble grape has been my goal for more than 36 years. 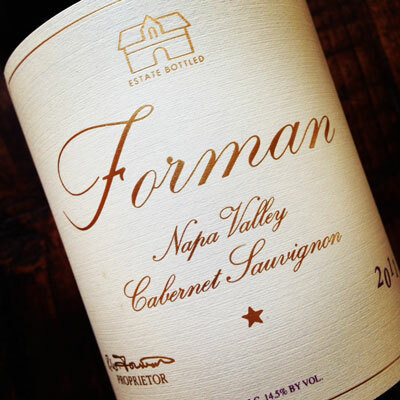 Since 1980 the Rutherford Star vineyard in the heart of the Rutherford Bench appellation has been the source of the Forman Vineyard Chardonnay. It has continued to produce consistent quality over the last 20 years. The Chardonnay is whole cluster pressed and exclusively fermented in Burgundy barrels. Left sur-lees for 7 months the wine is only racked once during its 9 months of barrel aging. Malolactic fermentation is intentionally inhibited. The wine emphasizes and develops a minerality which, with age, develops into a very racy and elegant food worthy wine.